Barnacle's Island is the home of Barnacle in Donkey Kong Country 3: Dixie Kong's Double Trouble!. It is located on a small island in the center of Lake Orangatanga. However, in the Game Boy Advance, Barnacle's Island was relocated to Pacifica, and Bachelor now lives on the island, which was renamed Bachelor Pad. In the original game, Barnacle's Island takes place in a log cabin just like every other Brothers Bear's residence. In the Game Boy Advance version, he lives inside a washed up ship, with a large whale protruding from the side. 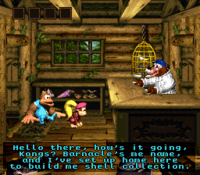 When Dixie Kong and Kiddy Kong pay a visit to Barnacle's Island, the old Brothers Bear will inform them that he is looking for a Shell to add to his collection. By bringing Barnacle the shell that's being sold at Bazaar's General Store, he will give the Kongs his Banana Bird in exchange.